Enchiladas are a Mexican speciality, consisting of a thin round tortilla bread rolled up with a spicy filling. Heat half the oil in a large frying pan. Add the onion, celery and garlic, fry for 4-5 minutes or until golden brown and soft. Add the sun-dried tomatoes and mushrooms, cook for a further 3-4 minutes, or until soft. Set aside and keep warm. Toss the chicken in the cumin and oregano, add the remaining oil to the pan and fry the chicken in two batches for 5-6 minutes each. Stir the chicken into the vegetable mixture, add the coriander, lemon juice and half the cheese. Season and mix well. Divide the chicken and vegetable mix between the tortillas, roll up and place seam side down into a greased baking pan. Sprinkle with the remaining cheese and bake in a preheated oven at 180ºC, gas mark 4 for 20-25 minutes or until golden brown. 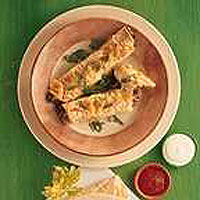 Serve two tortillas per person with salsa sauce and sour cream, garnished with chopped coriander leaves.